Notice that the Content Type is not editable once you've initially defined you page and saved it. 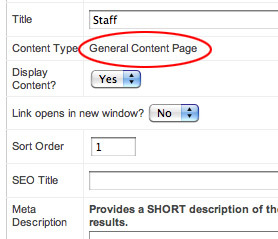 Once you define a page as a particular Content Type it can't be changed. To change a Content Type you would have to create a new page with the correct Content Type, then delete the old page. 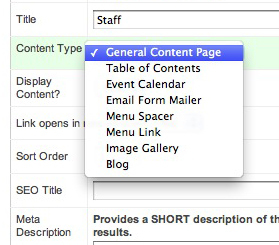 The Content type drop-down as seen when you are first setting up a page with the 'Define New' button. The Content Type becomes fixed, and cannot be changed once you've saved the page.